Sanremo, Italy’s Alex Liddi is among the 35 baseball players of Italian descent that proudly line the streets of San Diego’s Little Italy at the start of every MLB season. 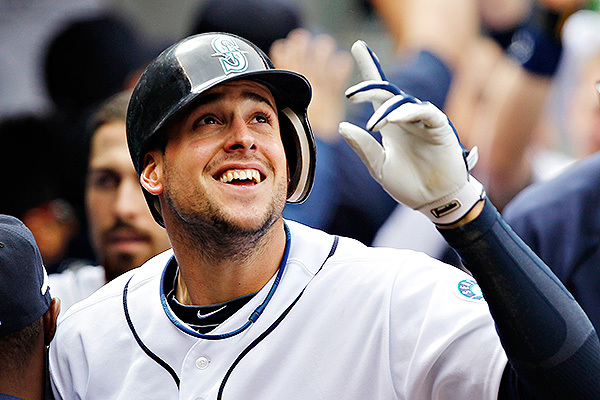 In 2011 Seattle Mariners’ Alex Liddi was the first Italian-born-and-raised player to reach the Major Leagues. 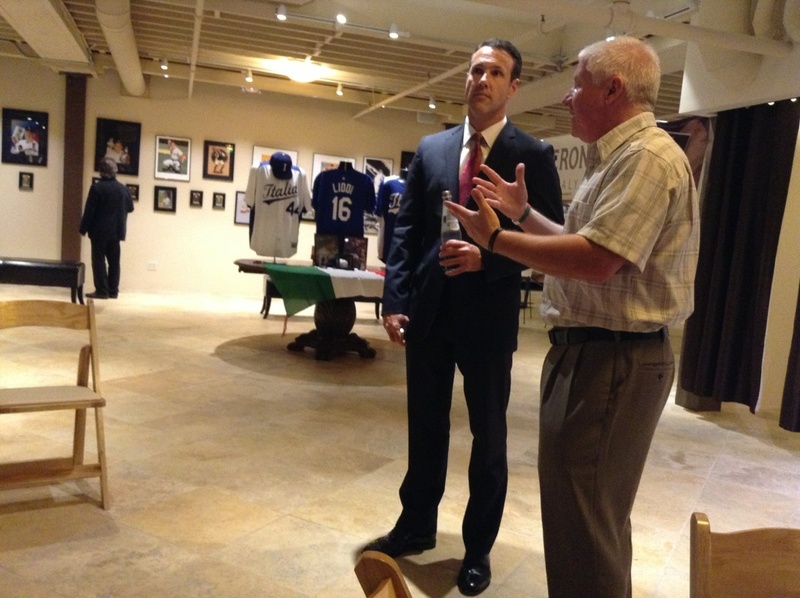 Although San Diego can lay claim to Team Italy’s lead off hitter/LA Dodgers infielder Nick Punto as their own born-and-raised MLB hero, Sanremo–a popular Italian Riviera resort town between Genoa and the French border–is the proud home of WBC teammate/Seattle Mariners third baseman Alex Liddi. Alex was literally weaned on baseball by his father, Agostino, and his mother, Flavia. Agostino’s parents left Italy shortly after World War II to work as tailors in America. While attending Beverly Hills High School, Agostino Liddi played baseball before repatriating to Italy after graduation. It was there that he met his future wife, Flavia, who played softball competitively in Italy. You could say that Alex was a truly a baseball baby since it was reported that Flavia played first base for the first three months of her pregnancy carrying Alex. When Alex was old enough to play, his mother coached his baseball teams. As a teenager, his father drove him long distances to compete in games throughout Italy. 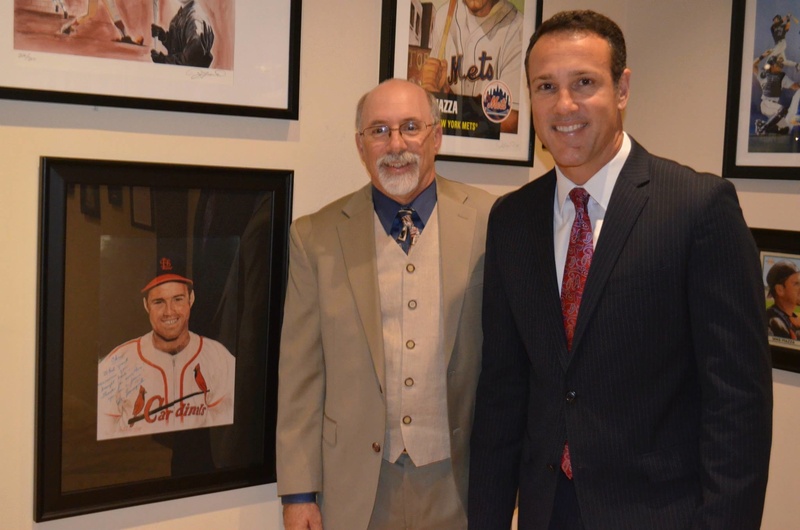 With the addition of their two sons, Thomas and Alex, the couple shared their love of the game to transform the Liddi’s into the archetypal Italian baseball family. 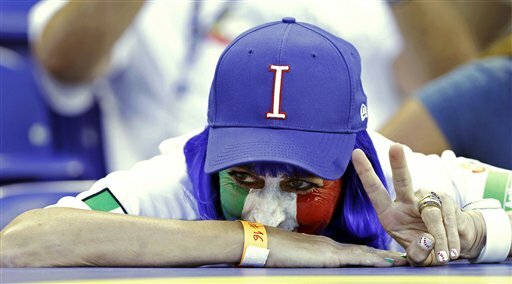 Alex Liddi’s mother, Flavia, traveled all the way from Sanremo to support her son playing for the Italian national team during the 2013 World Baseball Classic in Phoenix and Miami. 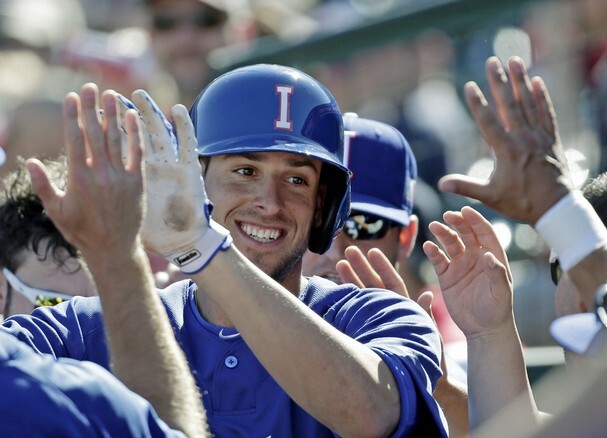 Alex Liddi is congratulated by Italy teammates after hitting an RBI double off Jered Weaver and a two-run homer off Jerome Williams in an exhibition game against the LA Angels of Anaheim on March 6, 2013. Liddi “the real ambassador of Italian baseball” after he became the first player from Italy to play in the Major Leagues since 1954 and the first-ever Italian-developed player in MLB. Liddi, the face of European baseball, has the opportunity to spur the growth of baseball back home by playing at the sport’s highest level. By watching Liddi on MLB.tv and reading the nightly box scores, young Italian athletes are now inspired to think that playing Major League Baseball is a viable option. 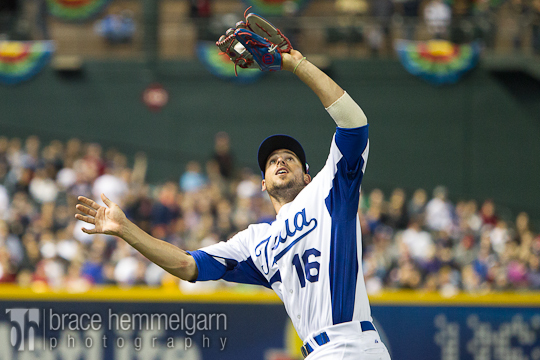 Italia’s Alex Liddi catches a fly ball against Team USA during the 2013 World Baseball Classic. 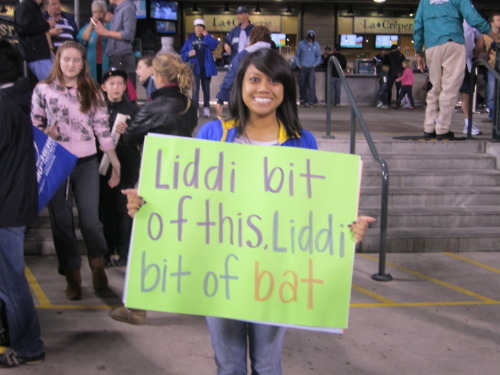 Seattle Mariners fans can’t wait for Alex Liddi’s return. 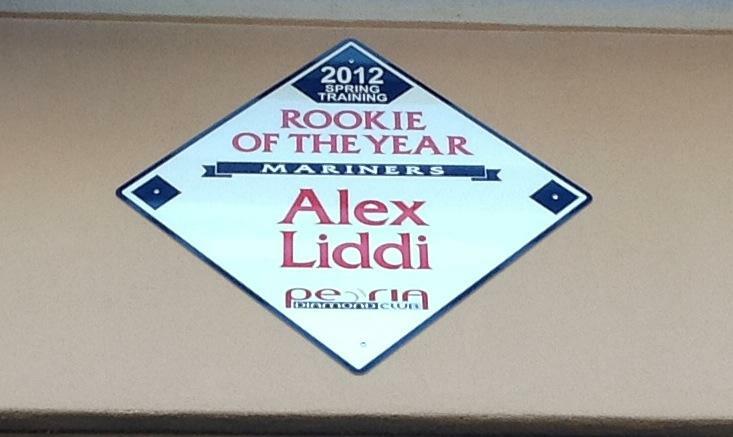 24-year-old Liddi will be a welcome addition to the Seattle lineup when MLB rosters expand to 40 players in September. 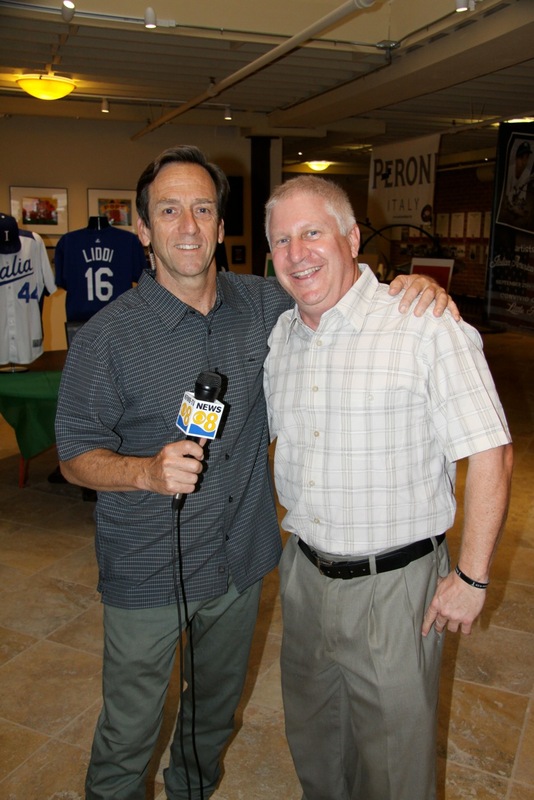 The European baseball ambassador was kind enough to sit down for an interview at the 2013 World Baseball Classic in Phoenix. Roberto: You were signed in 2005 by Mariners’ scout Wayne Norton and current WBC Team Spain manager Mauro Mazzotti. 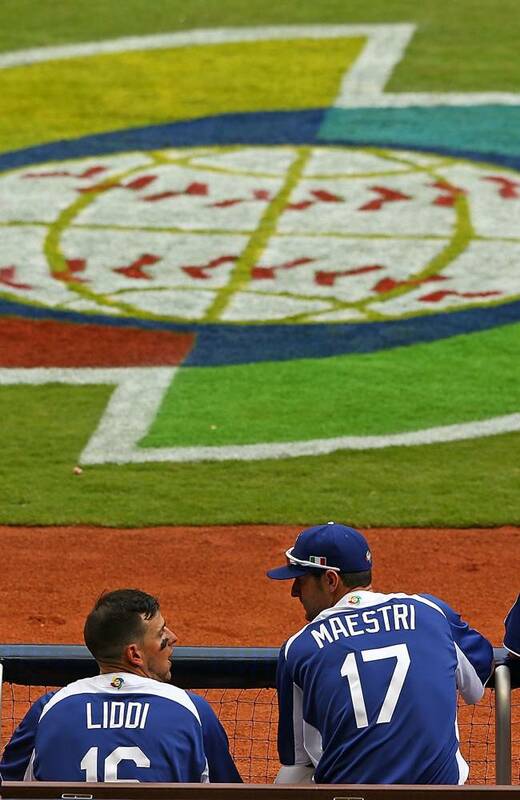 Isn’t that a good sign for Italian baseball when two Italian managers, Italy’s Marco Mazzieri and Spain’s Mauro Mazzotti, are leading two of Europe’s finest ballplayers in the WBC? Alex Liddi: Yeah, I’m happy for him that he is able to participate in the World Baseball Classic with another team. I wish him the best. 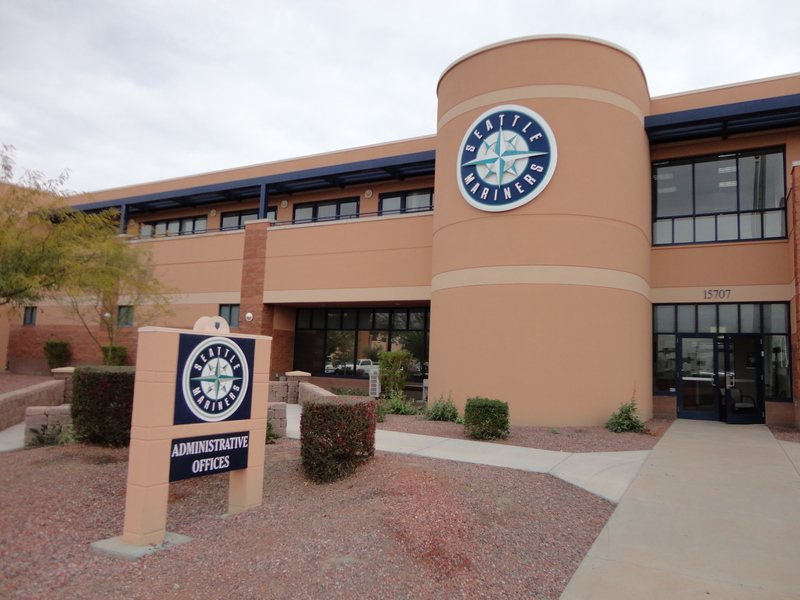 Roberto: Has the journey with the Seattle Mariners organization been a good experience so far? 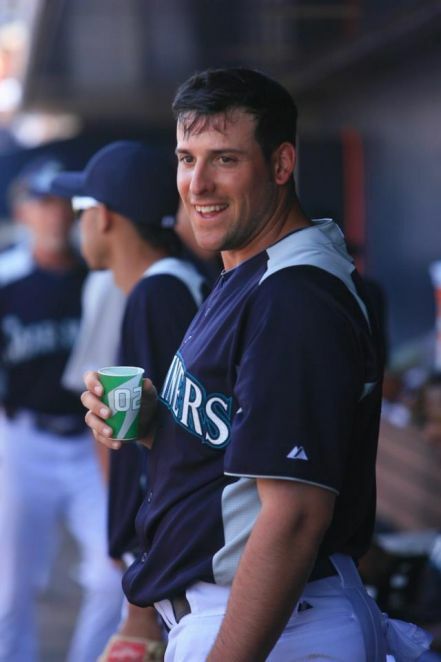 Alex Liddi: Yeah, I enjoy my time in Seattle and in the minor league system. I think that it’s a pretty good system. I’ve enjoyed my years playing with them. I’ve got to thank them for giving me a chance to play in the big leagues. So I’m really thankful. Roberto: You began your professional career in 2006 with the Peoria Mariners and then were then promoted to Single-A Wisconsin. You remained there until 2008 at which time you were batting .313 and enjoyed an eight-game hitting streak when you nearly hit .500! That must have been memorable? Alex Liddi: Yeah. At every level you go, you try to make adjustments. I was trying to show them that I could play in the states. Roberto: In 2009 playing for Single-A Advanced High Desert, you led the California League with a .345 batting average, 23 home runs, and 104 RBI. You were selected as a Cal League All-Star. In addition, you were awarded the Cal League MVP, Topps Cal League Player of the Year, Mariners Minor League Player of the Year and MLB.com Mariners Organization Player of the Year. What an accomplishment! Alex Liddi: Yeah, it we kind of my break out year. We had a good team that year so it was a little easier for me to put out good numbers plus it was a good hitter-friendly park. But that gave me the confidence, and it gave me the chance to keep going for the rest of that year. All these things combined made me have a really good year. Roberto: How did it feel playing on Team Canada at the Toronto’s Rogers Centre in the 2009 World Baseball Classic and beating the home team on their own turf? Alex Liddi: Yeah, it was a good time for me. It was probably one of the biggest memories of my life, of my career. I had the chance to beat Canada at the highest level of competition. It will always be something that I will bring with me. I am happy that I was there. that you were actually a big leaguer? Alex Liddi: Yeah, for sure. I remember that I had a good spring, but I was still young. me and told me that I was getting called up. It was kind of like all the dreams came true, and it was a big day for me. eye-opener playing in the front of the MLB media under the watchful eye of a worldwide televised audience. Alex Liddi: It was a real honor. I would have never expected that to have come to me. I was really happy to go there. It was really fun. Alex Liddi and Alessandro Maestri talk strategy in the Italia dugout. 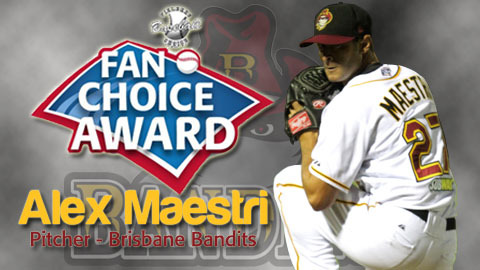 Roberto: You have a special bond with Alessandro Maestri, the first Italian-born-and-raised pitcher to be signed by MLB. He also waves the Italian baseball flag internationally just as you do. Let’s talk about your friendship and what makes him a competitor. still think he can. And then he got a chance to pitch in Japan and make it to the big leagues there. I’m really proud of him. Hopefully, he will have a long career. to play, he always makes a major impact. Alex Liddi: He has charisma. He has a really good attitude on and off the field that makes him a complete player. Good tools, good person, good teammate…so all these things combined together make him a really good player. 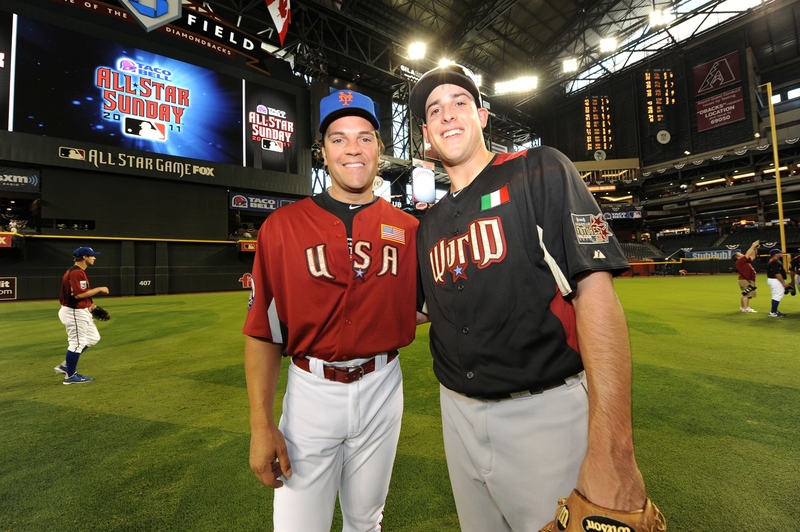 Roberto: What is different about Team Italia in the 2013 WBC from the previous team in 2009. What is different in the chemistry which makes the team such a dominant player in this year’s World Baseball Classic? Alex Liddi: Last time in the World Baseball Classic we had a good team, but this time we have been playing together more. I mean we already know Chris Denorfia, Nick Punto, Anthony Rizzo–I’ve known Rizzo for a couple years now. He’s been a friend of mine since I have been playing against him for a long time. The other guys have been playing together for a while now so the team is really together now. Instead of the other teams, they might bigger names but they have never played together like we do. Roberto: You could have a bunch of big names on a lineup card, but at the end of the day you look at the box score and the team with the biggest desire to win the game will actually succeed. Alex Liddi: I think we showed them already that we came here to win. We’re not joking and you can see it on our face…our enthusiasm on the field. We’re playing hard right now. We’re playing real baseball so everybody has to be careful. an invaluable Team Italia coach. Roberto: You are going out there playing nine one-inning games every contest, opponents should not take Team Italia lightly. Alex Liddi: We’re playing as a team. Everybody can come up with the big hit. Nobody has got to do too much. Everybody’s got other people’s back, you know. We keep playing like this, and we’ll do a lot of damage. Roberto: Having a stellar coaching staff which includes future Hall of Famer Mike Piazza and Frank Catalanotto, it must have a tremendous impact on your entire approach to baseball. Alex Liddi: For sure. I mean when you have a chance to have coaches like Mike Piazza and Frank Catalanotto—guys who have been in the big leagues for a long time—it makes it fun just to be around those guys. You’re able to ask them questions and learn from them so that’s another big part of the team right there too. Roberto: How proud are you being an Italian playing Major League Baseball and providing hope for Italian athletes that they too can play baseball professionally? 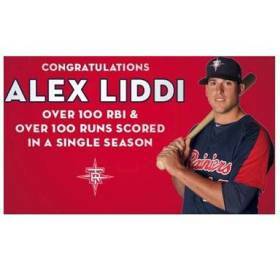 Alex Liddi: I’m really proud to have accomplished being the first Italian-born-and-raised player in the big leagues. It was something that I was always looking forward to coming up through the minors. That was my goal ever since getting signed. Getting closer to it, I could actually understand what it meant. As I got closer, and I was really excited about it. There was no pressure for me. It’s something I’m happy about that happened to me–getting to the big leagues. I’m really thankful to everybody for giving me the opportunity. Roberto: I love what you represent to Team Italia, your family, friends and fans. Now available in paperback through Univ. of Nebraska Press. 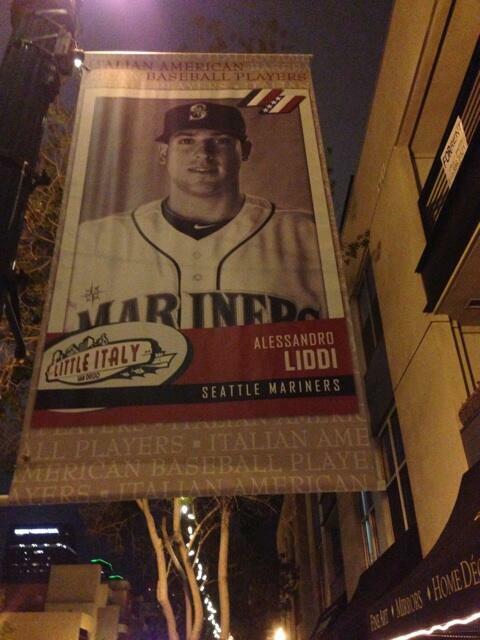 Although we won’t see Alex Liddi play in San Diego this year, we can still enjoy his banner in Little Italy. You will be pleasantly surprised by the number of Italian American baseball players that grace the streets of America’s finest city. 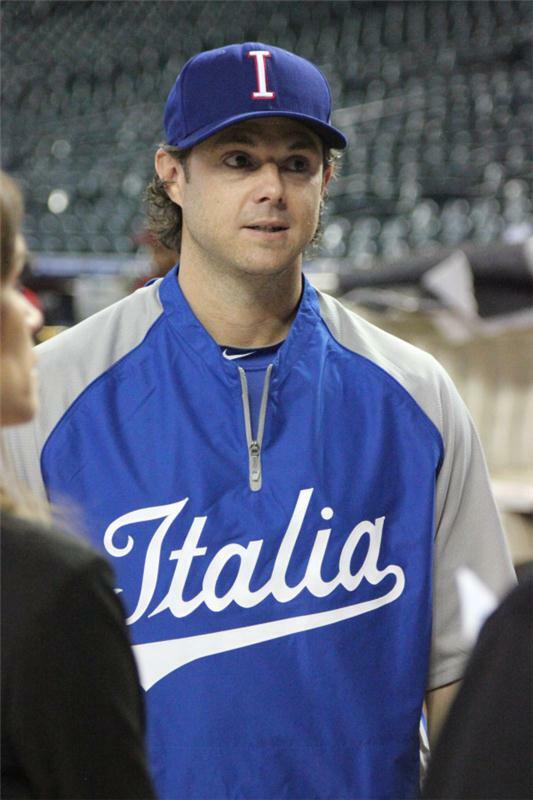 You will find Team Italia hitting coach Mike Piazza with 2013 World Baseball Classic players Nick Punto, Chris Denorfia, Anthony Rizzo, Chris Colabello and Jason Grilli in Little Italy. 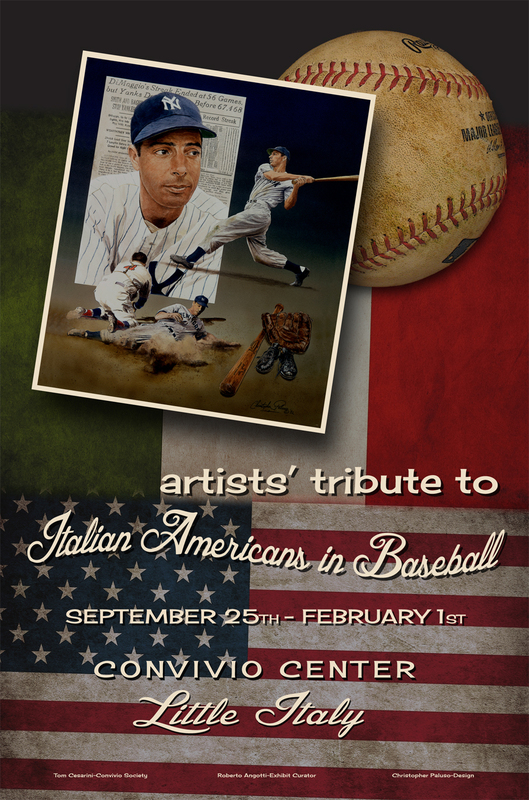 Other Italian American heroes on display include the likes of Jason Giambi, Barry Zito, Craig Biggio, Rich Aurilla, Gary Gaetti, Frank Viola, Rick Botallico, Ron Santo, Sal Bando, Tony Conigliaro, Pete Falcone, Roy Campanella, Rico Petrocelli, Tommy Lasorda, Bart Giamatti, Joe Pepitone, Joe Garagiola, Yogi Berra, Joe Torre, Frank Torre, Joe DiMaggio, Dom DiMaggio, Frank Crosetti, Phil Rizzuto, Nicholas Dallassandro, Charles Strada, Phil Cavaretta, and Babe Pinelli. 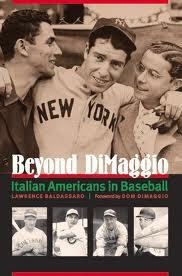 To learn more about Italian American players in Major League Baseball, pick up a copy of Lawrence Baldassaro’s Beyond DiMaggio: Italian Americans in Baseball.